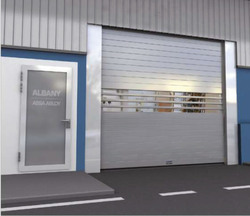 We are a leading Manufacturer of high speed flexible doors, industrial high speed doors, high speed sliding folding doors, high speed rapid doors, high speed safety doors and rolling doors from Mumbai, India. Drive unit - Electric motor with worm gear 0.37 KW potential free signals for door open/closed. 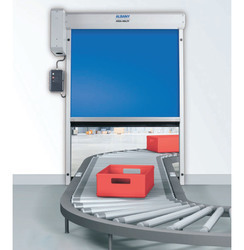 Safety devices - As the door was developed for the use in machinery no safety devices for passenger traffic are supplied as standard. 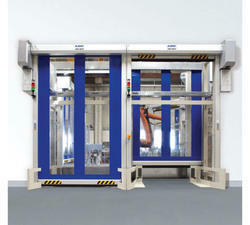 According to the machinery directive the door is regarded as machine. The operator is responsible for separating safety devices. SBR rubber panel - 2 layers of Styrene Butadiene Rubber (SBR) with polyester cord center. Breaking strength 1100lbs/in/ply. Available in black or tan color. EPDM rubber panel - Optional. Available in blue or gray color. Door Curtain – The Door Curtain has a curtain made of a 20 mm thick insulating curtain with horizontal connecting profiles. 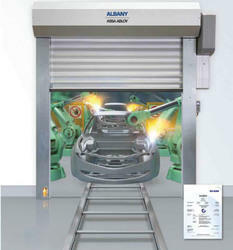 Door Structure – The side frames, roll cover and motor cover are made of anodised aluminium. 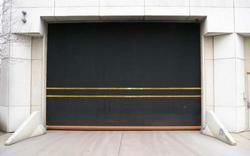 | The flexible bottom profile is made of black insulation material with an additional seal in yellow PVC. Heating – Depending on the ambient temperature and installation site the side frames, lintel profile, drive unit and control box are equipped with a heater. Likewise a heated stationary photocell can be used depending on the ambient temperature. Drive – The Drive unit is geared motor that can be mounted on the right to left. Control – The controller is an MCC vector control frequency converter control system which supports a wide range of speeds, supply voltages and options for connecting control and safety devices. 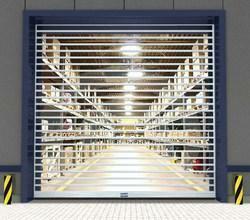 Manual Operation – In the event of a power outage, the door can be manually opened using a crank handle on the motor. 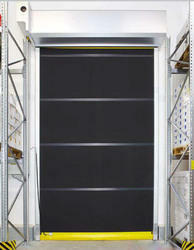 Installation Site – suitable for use in refrigeration and deep freeze applications. Safety Advice – The door safety devices are designed for the normal use of power-operated doors in accordance with the harmonised CE directives. In addition, aggravated environmental conditions may affect the proper use of deep freeze doors. In such situations, we recommended that you consult our local sales engineers for expert advice on specific sitautions. Side frames - Edged galvanized steel profiles. Springs for curtain tension and counterbalance in the side frame. 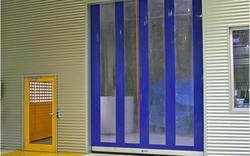 Flexible High Performance Door, opening in vertical direction for use as a machine protection door. Side frames - Made of aluminum with integrated safety switches, all fittings galvanized. 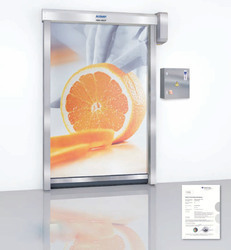 Front of side frame lifts of for generous access to safety limit switches and fixtures. Door curtain - Made of RollTex Plus - color blue (similar RAL 5002), orange (similar RAL 2009), grey (similar RAL 7001). Wind protection - Through wind tabs on the door curtain. Wind resistance - Class 1 (EN 12424). Safety devices - Electrical safety contact edge, only available with MCC control unit. | No door line photocell | Cable chain integrated in side frame for evaluation of closing edge monitoring. | Drop down protection integrated in gear box. | Safety switches Magnetic switch with evaluation unit for performance level e, acc. to EN ISO 13849-1, and SIL3, acc. to EN 62061, integrated in side frame. Door curtain - Travitop 1.3 mm in color Blue (similar RAL 5010) Grey (similar RAL 7035) or Red (similar RAL 3002). Control unit - Door with standard control unit and frequency converter 0.85 KW, located at the drive unit. | Supply voltage 1(N)PE 230V; 50/60 Hz or 3/N/PE 400V, 50/50 Hz, opening / closing speed max. 1.8 / 1.1 m/s | The control unit can be equipped with a module for fault reports. 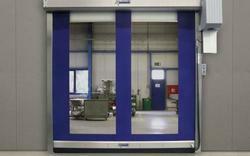 Flexible High Performance Door, opening in vertical direction for interior use in wind protected areas. Self-supporting side frames - Made of galvanized steel, all fittings galvanized. Door curtain - Made of transparent PVC material with coated fabric reinforcement stripes, ultramarine (similar to RAL 5002) or red (similar to RAL 3002). Bottom profile - Anodized aluminum. Safety devices - Electrical safety contact edge, door line photocell, drop down protection integrated in gear box. Manual activation - By means of a crank. Opening / closing Speed - Up to max. 1.0 / 1.0 m/s. 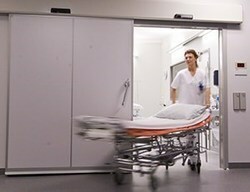 Door curtain - Door curtain of ecru anodized aluminum lamellas, hinge less connected by means of flexible heavy belts, wear-less to wind up without to contact each other, each single lamella can be replaced easily, pre-fitted on the top roll. Manual activation - By releasing the brake at ground level. Partly opening by means of the pre-stressed tension springs. 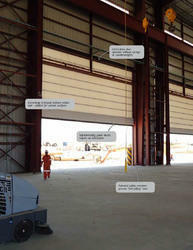 Flexible High Performance Door, opening in vertical direction for interior use in wind-protected areas. Door curtain - Made of transparent PVC material with fabric reinforcement stripes, ultramarine (similar to RAL 5002) or red (similar to RAL 3002). Safety devices - Electrical safety contact edge, Evaluation via integrated cable chain, door line photocell in the side frames , drop down protection by integrated balancing system. Manual activation - By releasing the brake at ground level. Depending on width/height ratio the door opens up to max. 2.0 m.
Opening / closing Speed - Up to max. 1.2 / 1.2 m/s. Size max - (DW x DH) 5000 x 5000 mm. Safety devices - Electrical safety contact edge, stationary safety photocell, and drop down protection by integrated balancing system. Side frames - Extruded aluminum profiles, springs for curtain tension and counterbalance in the side frames. Door curtain - Transparent material with reinforcement stripes, ultramarine (similar to RAL 5002) or red (similar to RAL 3002). Wind resistance - Class 2 (EN 12424). Knock out capability - With sensor. After a crash it repairs automatically by activating the "close" button. We are one of the leading manufacturer and supplier of HOSPITAL O.T. 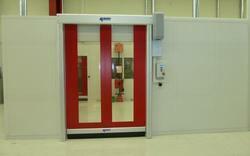 DOORS.We obligated to meet the quality standards as per the customer demand. 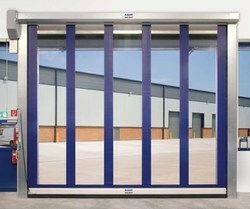 Looking for High Speed Rapid Roll Up Doors ?